As a boy my family moved to England, and there I became captivated by the handmade, European racing bicycle. 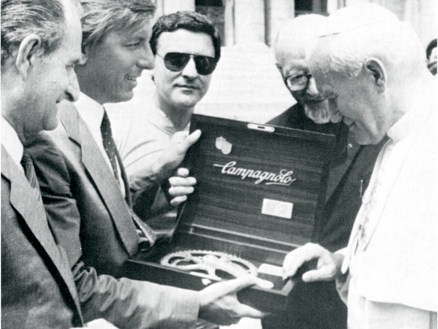 I remember a fellow in grammar school giving me a catalogue titled Cycle Aids, which was to be my first introduction to Campagnolo cycling components. When we returned to the States, I discovered Bicycling Magazine, which had just sprung up in my own back yard of Marin County. Over the next few years of pouring over these and other spin-off cycling journals, I built up quite a massive “portfolio” of racing bike lore. It wasn’t until many years later, when I created Euro Freddie, that I was able to share much of this well-ripened, cycling fromaggio. The occasion was the Napa Valley Eagle Cycling Club Newsletter. Each month’s column was usually based on some esoteric cycling tidbit, and then under the auspices of creative license, whipped into a self-styled and rakish work of dubious literary palatability.